Have your home inspected by a professional with years of knowledge and the experience you need to insure your next purchase will be right for you and your family's peace of mind. Your home is the single largest investment you might ever make...and you should know everything about your purchase. Home inspections are highly recommended for both old AND new houses. Even new houses may be constructed incorrectly or have hidden problems that a real estate home inspector can help find to give you and your family peace of mind with your home investment. In addition, if you are selling your house, maximize your return by learning if any critical improvements should be made before listing your house. We serve your interests as a prospective home seller or buyer and we strive to give you a comprehensive and thorough home inspection in San Marcos, Kyle or any other city in Central Texas. 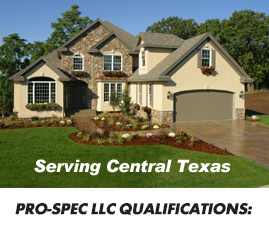 PRO-SPEC serves Central Texas including most areas of Travis, Hays, Caldwell, Comal, and Guadalupe Counties. Competitive pricing is based primarily on square footage and optional systems. There are no additional travel fees. Allow us to build your trust by making your first phone call to us. We will walk you through the steps you need to know to have your home inspection in San Marcos, Kyle or any other Central Texas location go smoothly and to make sure that you can make an informed decision on your next home purchase. Call or email anytime Monday through Saturday. Current on all yearly continuing education requirements. © Copyright - Pro-Spec Real Estate Inspections of Central Texas. 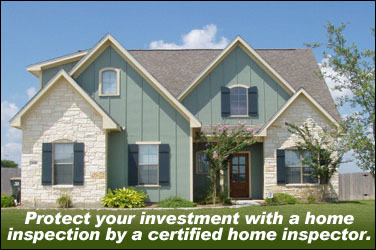 Including home inspections in San Marcos, Kyle, Wimberley, Buda.